A couple months ago I went to a French cafe at the Denver airport. Outside the restaurant was a large rotating menu, clearly costly to manufacture. 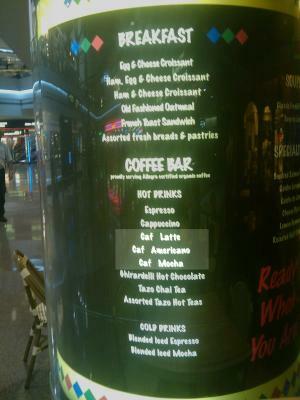 Some of the beverages on the menu puzzled me: "Caf Latte", "Caf Americano", and "Caf Mocha". When I saw "Proven al Salad", I realized that they had suffered an unfortunate accented character mishap; the menu was supposed to offer "Café Latte", "Café Americano", "Café Mocha", and "Provençal Salad". Unfortunately, the accented characters disappeared somewhere in the sign printing process. The font, likely Marker Felt Thin, has accented characters, so they should have been able to get it right. So... can any deep insight be extracted from this, or is it just a somewhat entertaining picture? My first conclusion is that notwithstanding the Arc Unicode debacle, support for non-ASCII characters is important even if you're a sign shop in Denver. My second conclusion (based on personal experience) is that everything conspires to destroy non-ASCII characters, and it's non-trivial to get them right. My third conclusion - which will make sense if you've seen UTF-8 get misinterpreted as latin-1 - is the restaurant should be grateful that they didn't end up with "CafÃ© Latte".